Setting strategic direction for cyberspace means presenting a comprehensive picture of linking organizational mission, vision, strategic goals, strategic objectives, performance measures, targets, strategic initiatives and the budget… all part of the language of strategic planning and components of strategic management. In previous PA Times Online articles, this author examined cyberspace performance measurement [April 4, 2017], thinking strategically about goals and targets in the cyberspace domain [Oct 3, 2017], defining the unique mission of cyberspace organizations [Feb 9, 2018], and the need for directly-measurable cyberspace strategic objectives [July 6, 2018]. 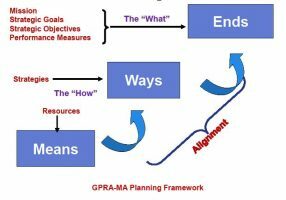 Mission statement, vision statement, strategic goals, and strategic objectives are all critical strategic planning requirements of the Government Performance and Results Act (GPRA) and the GPRA Modernization Act. To complete the cycle, this article for the PA Times Online will explore how an Organizational Strategy, as part of an agency performance assessment can improve senior leadership decision-making and strategic communication. Here’s a simple example. Let’s suppose you have a personal goal to “Lead a healthy lifestyle.” You might have as one of your objectives “Lose 20 pounds in one year.” In that objective, the Direction of Change is “Lose”; the Performance Measure is “Weight in pounds [implied]; the Target Amount is “20 pounds” and the Date is 12 months from the start date. Make sense? So far, so good. What are some of the actions you could do to ensure you meet the objective? What are some of the activities that would result in losing weight? I’m sure all of you could think of many: increase amount of exercise, decrease amount of fats in diet, cut back on calories, etc., etc. All these actions are your “strategy” for losing weight. The mission statement, vision statement, strategic goals, strategic objectives, and strategic performance measures clearly articulate this question. How are the strategic goals and strategic objectives to be achieved? Do the strategies logically link the agency’s goals and objectives to its day-to-day operations, i.e. do they chart a course to get the agency from here to there? Do they describe what resources (human, capital, information, funding) are required to achieve the agency’s goals and objectives? Do they include steps to disseminate goals and objectives within the agency and to hold managers accountable for results? Do they describe whether programs or activities need to be created, eliminated, or restructured to achieve goals and objectives? Do they consider alternative strategies? Most organizations do not suffer from a lack of initiatives; in fact, many federal-sector agencies begin their strategic planning/performance management efforts with initiative development [a very, very bad idea!!!]. Mission and strategic goals come first; next up are strategic objectives and performance measures; targets supply the mark to aim for; and strategy/initiatives are how the organization meets the objective. In cyberspace organizations, the concept of cyberspace performance management means implementing a cyberspace strategy which means meeting the cyberspace objective which means meeting the cyberspace goal which means meeting the overall cyber mission.